Melbourne is known for museums, shopping, parks, zoos & aquariums, and nightlife. Your plan includes some of its best attractions: admire the natural beauty at Royal Botanic Gardens, indulge in some culinary diversions at a local gastronomic tour, enjoy unforgettable views with a balloon tour, and meet the residents at Melbourne Zoo. To find reviews, where to stay, more things to do, and tourist information, read our Melbourne travel route planner . Auckland, New Zealand to Melbourne is an approximately 7-hour flight. Traveling from Auckland to Melbourne, you'll gain 2 hours due to the time zone difference. Expect a bit cooler evenings in Melbourne when traveling from Auckland in April, with lows around 11°C. Finish your sightseeing early on the 17th (Wed) so you can travel to Sydney. Sydney is known for nightlife, trails, beaches, parks, and museums. 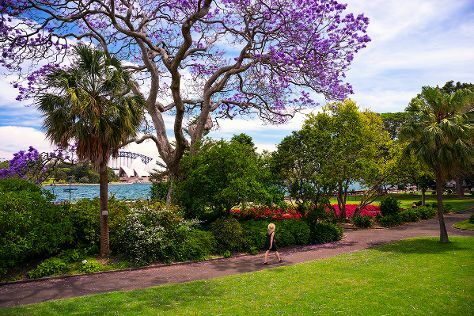 Your plan includes some of its best attractions: admire the natural beauty at Royal Botanic Garden Sydney, wander the streets of The Rocks, admire nature's wide array of creatures at Sea Life Sydney Aquarium, and kick back and relax at Manly Beach. To see traveler tips, photos, and more tourist information, you can read our Sydney trip planner . You can fly from Melbourne to Sydney in 3.5 hours. Other options are to do a combination of shuttle and flight; or drive. Plan for somewhat warmer nights when traveling from Melbourne in April since evenings lows in Sydney dip to 17°C. Wrap up your sightseeing by early afternoon on the 22nd (Mon) to allow enough time to travel back home.